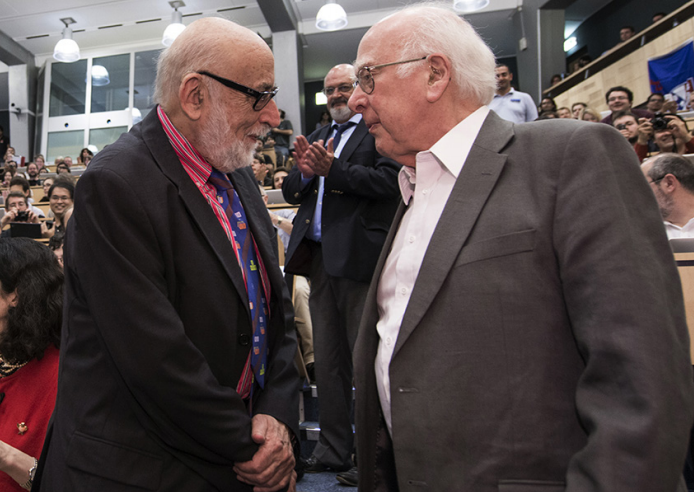 In 2013 the Nobel Prize in Physics was awarded to Francois Englert and Peter Higgs for their development in 1964 of the mass generation mechanism (the Higgs mechanism) in local gauge theories. This mechanism requires the existence of a massive scalar particle, the Higgs boson, and in 2012 the Higgs boson was finally observed at the Large Hadron Collider after an almost half a century search. In this talk we review the work of these Nobel recipients and discuss its implications. The awarded mechanism is a central part of the Standard Model of particle physics that describes how the world is constructed. According to the Standard Model, everything, from flowers and people to stars and planets, consists of just a few building blocks: matter particles. These particles are governed by forces mediated by force particles that make sure everything works as it should. The entire Standard Model also rests on the existence of a special kind of particle: the Higgs particle. It is connected to an invisible field that fills up all space. Even when our universe seems empty, this field is there. Had it not been there, electrons and quarks would be massless just like photons, the light particles. And like photons they would, just as Einstein’s theory predicts, rush through space at the speed of light, without any possibility to get caught in atoms or molecules. Nothing of what we know, not even we, would exist. The Higgs particle, H, completes the Standard Model of particle physics that describes building blocks of the universe. Both François Englert and Peter Higgs were young scientists when they, in 1964, independently of each other put forward a theory that rescued the Standard Model from collapse. 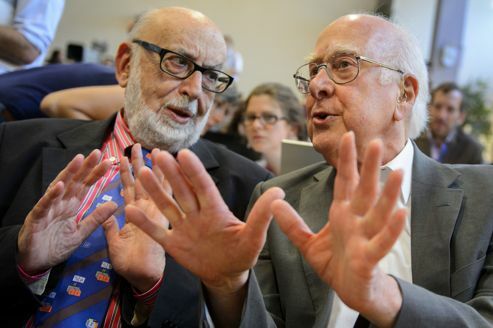 Almost half a century later, on Wednesday 4 July 2012, they were both in the audience at the European Laboratory for Particle Physics, CERN, outside Geneva, when the discovery of a Higgs particle that finally confirmed the theory was announced to the world. The idea that the world can be explained in terms of just a few building blocks is old. Already in 400 BC, the philosopher Democritus postulated that everything consists of atoms —átomos is Greek for indivisible. nucleus made up of neutrons and protons. And neutrons and protons, in turn, consist of smaller particles called quarks. Actually, only electrons and quarks are indivisible according to the Standard Model. The atomic nucleus consists of two kinds of quarks, up quarks and down quarks. So in fact, three elementary particles are needed for all matter to exist: electrons, up quarks and down quarks. But during the 1950s and 1960s, new particles were unexpectedly observed in both cosmic radiation and at newly constructed accelerators, so the Standard Model had to include these new siblings of electrons and quarks. Besides matter particles, there are also force particles for each of nature’s four forces — gravitation, electro magnetism, the weak force and the strong force. Gravitation and electromagnetism are the most well-known, they attract or repel, and we can see their effects with our own eyes. The strong force acts upon quarks and holds protons and neutrons together in the nucleus, whereas the weak force is responsible for radioactive decay, which is necessary, for instance, for nuclear processes inside the Sun. The Standard Model of particle physics unites the fundamental building blocks of nature and three of the four forces known to us (the fourth, gravitation, remains outside the model). For long, it was an enigma how these forces actually work. For instance, how does the piece of metal that is attracted to the magnet know that the magnet is lying there, a bit further away? And how does the Moon feel the gravity of Earth? The explanation offered by physics is that space is filled with many invisible fields. The gravitational field, the electromagnetic field, the quark field and all the other fields fill space, or rather, the four dimensional space-time, an abstract space where the theory plays out. The Standard Model is a quantum field theory in which fields and particles are the essential building blocks of the universe. In quantum physics, everything is seen as a collection of vibrations in quantum fields. These vibrations are carried through the field in small packages, quanta, which appear to us as particles. Two kinds of fields exist: matter fields with matter particles, and force fields with force particles — the mediators of forces. The Higgs particle, too, is a vibration of its field — often referred to as the Higgs field. Without this field the Standard Model would collapse like a house of cards, because quantum field theory brings infinities that have to be reined in and symmetries that cannot be seen. 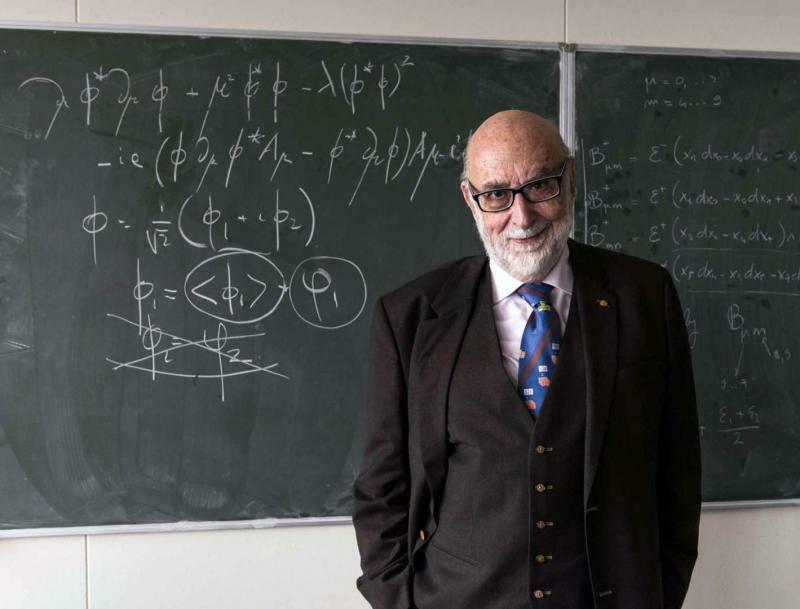 It was not until François Englert with Robert Brout, and Peter Higgs, and later on several others, showed that the Higgs field can break the symmetry of the Standard Model without destroying the theory that the model got accepted. This is because the Standard Model would only work if particles did not have mass. As for the electromagnetic force, with its massless photons as mediators, there was no problem. The weak force, however, is mediated by three massive particles; two electrically charged W particles and one Z particle. They did not sit well with the light-footed photon. How could the electroweak force, which unifies electromagnetic and weak forces, come about? The Standard Model was threatened. This is where Englert, Brout and Higgs entered the stage with the ingenious mechanism for particles to acquire mass that managed to rescue the Standard Model. The Higgs field is not like other fields in physics. All other fields vary in strength and become zero at their lowest energy level. Not the Higgs field. Even if space were to be emptied completely, it would still be filled by a ghost-like field that refuses to shut down: the Higgs field. We do not notice it; the Higgs field is like air to us, like water to fish. But without it we would not exist, because particles acquire mass only in contact with the Higgs field. Particles that do not pay attention to the Higgs field do not acquire mass, those that interact weakly become light, and those that interact intensely become heavy. For example, electrons, which acquire mass from the field, play a crucial role in the creation and holding together of atoms and molecules. If the Higgs field suddenly disappeared, all matter would collapse as the suddenly massless electrons dispersed at the speed of light. 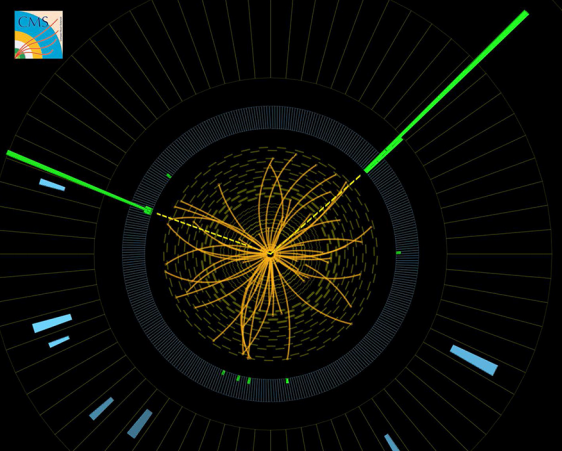 So what makes the Higgs field so special? It breaks the intrinsic symmetry of the world. In nature, symmetry abounds; faces are regularly shaped, flowers and snowflakes exhibit various kinds of geometric symmetries. Physics unveils other kinds of symmetries that describe our world, albeit on a deeper level. One such, relatively simple, symmetry stipulates that it does not matter for the results if a laboratory experiment is carried out in Stockholm or in Paris. Neither does it matter at what time the experiment is carried out. Einstein’s special theory of relativity deals with symmetries in space and time, and has become a model for many other theories, such as the Standard Model of particle physics. The equations of the Standard Model are symmetric; in the same way that a ball looks the same from whatever angle you look at it, the equations of the Standard Model remain unchanged even if the perspective that defines them is changed. German mathematician Emmy Noether could show that the conservation laws of physics, such as the laws of conservation of energy and conservation of electrical charge, also originate in symmetry. Symmetry, however, dictates certain requirements to be fulfilled. A ball has to be perfectly round; the tiniest hump will break the symmetry. For equations other criteria apply. And one of the symmetries of the Standard Model prohibits particles from having mass. Now, this is apparently not the case in our world, so the particles must have acquired their mass from somewhere. This is where the now-awarded mechanism provided a way for symmetry to both exist and simultaneously be hidden from view. Our universe was probably born symmetrical. At the time of the Big Bang, all particles were massless and all forces were united in a single primordial force. This original order does not exist anymore — its symmetry has been hidden from us. 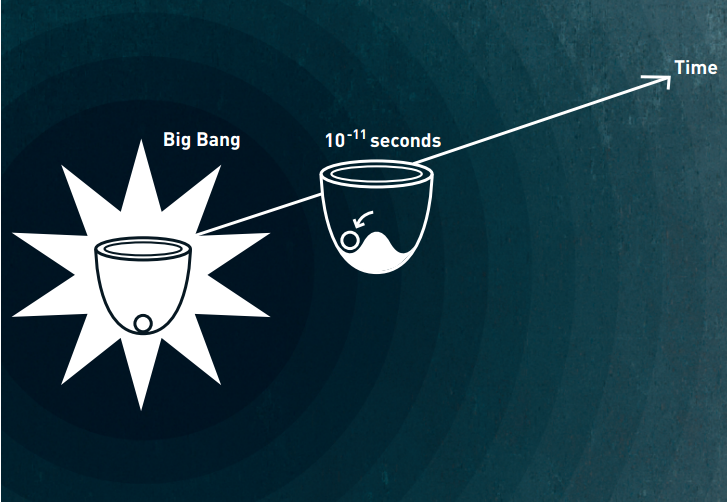 Something happened just 10–11 seconds after the Big Bang. The Higgs field lost its original equilibrium. How did that happen? It all began symmetrically. This state can be described as the position of a ball in the middle of a round bowl, in its lowest energy state. With a push the ball starts rolling, but after a while it returns down to the lowest point. However, if a hump arises at the centre of the bowl, which now looks more like a Mexican hat, the position at the middle will still be symmetrical but has also become unstable. The ball rolls downhill in any direction. The hat is still symmetrical, but once the ball has rolled down, its position away from the centre hides the symmetry. In a similar manner the Higgs field broke its symmetry and found a stable energy level in vacuum away from the symmetrical zero posi tion. This spontaneous symmetry breaking is also referred to as the Higgs field’s phase transition; it is like when water freezes to ice. The universe was probably created symmetric, and the invisible Higgs field had a symmetry that corresponds to the stable position of a ball in the middle of a round bowl. But already 10–11 seconds after the Big Bang, the Higgs field broke the symmetry when it moved its lowest level of energy away from the symmetrical centre-point. In order for the phase transition to occur, four particles were required but only one, the Higgs particle, survived. The other three were consumed by the weak force mediators, two electrically charged W particles and one Z particle, which thereby got their mass. In that way the symmetry of the electroweak force in the Standard Model was saved — the symmetry between the three heavy particles of the weak force and the massless photon of the electromagnetic force remains, only hidden from view. The Nobel Laureates probably did not imagine that they would get to see the theory confirmed in their lifetime. It took an enormous effort by physicists from all over the world. For a long time two laboratories, Fermilab outside Chicago, USA, and CERN on the Franco-Swiss border, competed in trying to discover the Higgs particle. But when Fermilab’s Tevatron accelerator was closed down a couple of years ago, CERN became the only place in the world where the hunt for the Higgs particle would continue. CERN was established in 1954, in an attempt to reconstruct European research, as well as relations between European countries, after the Second World War. Its membership currently comprises twenty states, and about a hundred nations from all over the world collaborate on the projects. CERN’s grandest achievement, the particle collider LHC (Large Hadron Collider) is probably the largest and the most complex machine ever constructed by humans. Two research groups of some 3,000 scientists chase particles with huge detectors — ATLAS and CMS. The detectors are located 100 metres below ground and can observe 40 million particle collisions per second. This is how often the particles can collide when injected in opposite directions into the circular LHC tunnel, 27 kilometres long. Protons are injected into the LHC every ten hours, one ray in each direction. A hundred thousand billion protons are lumped together and compressed into an ultra-thin ray — not entirely an easy endeavour since protons with their positive electrical charge rather aim to repel one another. They move at 99.99999 per cent of the speed of light and collide with an energy of approximately 4 TeV each and 8 TeV combined (one teraelectronvolt = a thousand billion electronvolts). One TeV may not be that much energy, it more or less equals that of a flying mosquito, but when the energy is packed into a single proton, and you get 500 trillion such protons rushing around the accelerator, the energy of the ray equals that of a train at full speed. In 2015 the energy will be almost the double in the LHC. 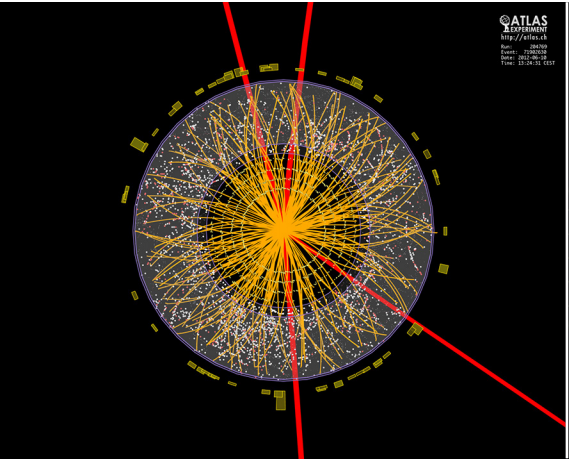 A possible discovery in the ATLAS detector shows tracks of four muons (red) that have been created by the decay of the short-lived Higgs particle. Particle experiments are sometimes compared to the act of smashing two Swiss watches together in order to examine how they are constructed. But it is actually much more difficult than so, because the particles scientists look for are entirely new — they are created from the energy released in the collision. According to Einstein’s well-known formula E = mc2, mass is a kind of energy. And it is the magic of this equation that makes it possible, even for massless particles, to create something new when they collide; like when two photons collide and create an electron and its antiparticle, the positron, or when a Higgs particle is created in the collision of two gluons, if the energy is high enough. The protons are like small bags filled with particles — quarks, antiquarks and gluons. The majority of them pass one another without much ado; on average, each time two particle swarms collide only twenty full frontal collisions occur. Less than one collision in a billion might be worth following through. This may not sound much, but each such collision results in a sparkling explosion of about a thousand particles. At 125 GeV, the Higgs particle turned out to be over a hundred times heavier than a proton and this is one of the reasons why it was so difficult to produce. However, the experiment is far from finished. The scientists at CERN hope to bring further ground breaking discoveries in the years to come. 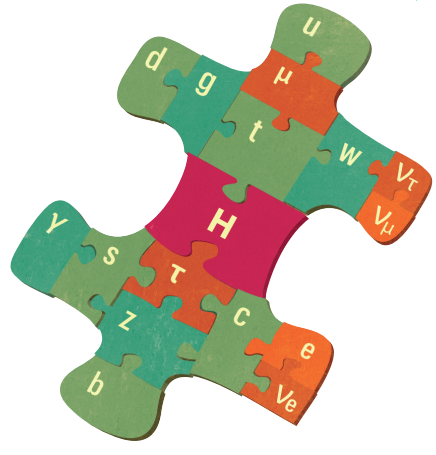 Even though it is a great achievement to have found the Higgs particle — the missing piece in the Standard Model puzzle — the Standard Model is not the final piece in the cosmic puzzle. One of the reasons for this is that the Standard Model treats certain particles, neutrinos, as being vir tually massless, whereas recent studies show that they actually do have mass. Another reason is that the model only describes visible matter, which only accounts for one fifth of all matter in the universe. The rest is dark matter of an unknown kind. It is not immediately apparent to us, but can be observed by its gravitational pull that keeps galaxies together and prevents them from being torn apart. particle is special; maybe it could manage to establish contact with the enigmatic darkness. Scientists hope to be able to catch, if only a glimpse, of dark matter, as they continue the chase of unknown particles in the LHC in the coming decades. Le physicien Peter Higgs reconnaît lui-même devoir partager la paternité de « sa » particule avec plusieurs collègues, aux premiers rangs desquels deux Belges, Richard Brout et François Englert. Preuve que l’idée était dans l’air du temps, trois autres chercheurs, Gerald Guralnik, Carl Hagen et Tom Kibble, ont eux aussi publié un papier très similaire avant la fin de l’année 1964, toujours dans le même journal. Certains manuels de physique appellent d’ailleurs le mécanisme décortiqué indépendamment par les six chercheurs, mécanisme de Brout-Englert-Higgs-Hagen-Guralnik-Kibble (ou BEHHGK). Un prix Nobel pour François Englert et Peter Higgs? «Il faut attendre 1972 pour qu’un autre physicien, Gerard ‘t Hooft, Prix Nobel en 1999, formalise l’existence d’une particule associée au champ scalaire», explique Étienne Klein. C’est d’ailleurs à cette époque que l’idée commence à s’installer dans la communauté scientifique. «Alors qu’on dénombre moins de dix citations par an du papier de Higgs jusque-là, le nombre décolle à 20 puis à 50 pendant les années 1970», rapporte le chercheur. Peu à peu, la nouvelle particule prend alors une place de plus en plus essentielle dans le modèle standard de la physique, dont elle vient combler les lacunes. Il serait tentant de penser que Peter Higgs a cherché à tirer la couverture à lui en tentant d’imposer son nom au boson éponyme, mais il n’en est rien. L’homme, aujourd’hui âgé de 82 ans, n’a eu de cesse de répéter aux médias qui ont bien voulu l’interroger à ce sujet que cette «découverte» théorique ne lui appartenait pas et qu’il y associait bien volontiers ses collègues. François Englert répète quant à lui à l’envi qu’il ne souhaite pas que son nom soit accolé à celui de Higgs. Il aimerait en revanche qu’on retienne l’appellation de «boson scalaire», qui, selon lui, décrit mieux ce qu’il représente. Les deux hommes pourraient obtenir un prix Nobel conjoint pour leurs travaux dès cette année. Leur collègue Richard Brout, décédé en mai 2011, n’aura malheureusement pas cette chance, la prestigieuse récompense ne pouvant être décernée à titre posthume.